This brochure profiles the products and services offered by one of the largest companies in the world commercial vehicle business - Land Rover-Leyland Ltd.
- and its vehicles are marketed in every continent. Land Rover-Leyland Ltd is one of the world's leading commercial vehicle businesses. Its products are world famous. It is part of BL Public Limited Company. Land Rover-Leyland International Holdings Ltd - Subsidiaries, associates and trade investments outside the UK. Our key objective is to design, manufacture and sell world class vehicles, providing payloads of 1 tonne and above, for the cost effective movement of people and goods, in both the civil and defence markets. The Group is organised on a decentralised basis and is managed through six operating companies (each servicing well defined market sectors) which together employ 22,000 people in the UK, two main overseas manufacturing companies (in India and Spain) and some dozen overseas sales and assembly companies (in Europe and Africa). This management structure was established in 1981. It has made possible a rapid and more effective response to the demands on the market place and to the need for internal restructuring of the business. The UK market is important to Land Rover-Leyland, but markets outside the UK account for just over half of 1984's consolidated sales revenue of £ 1.1 billion. If associate companies were taken into account, sales outside the UK would amount to well over half total sales revenues. In total the companies (including associates) produced and sold some 90,000 vehicles in 1984. Since 1981 the business has undertaken a major renewal of the product range. This has involved the replacement or significant upgrading of just about every product sold. The result is a very competitive range of new or substantially renewed products. All Land Rover-Leyland vehicles offer excellent value for money when such factors as running and maintenance costs are included. In the search to provide even better value for money for our customers, Land Rover-Leyland has recently commissioned new research to develop and improve the life cycle cost concept and its application to commercial vehicles. The benefits of this research are being incorporated in our products. In more than 150 markets around the world, Land Rover has become the generic term for durable, rugged on and off road transport - a reputation earned over more than 35 years of service. More recently, the Range Rover has developed a unique reputation for refinement and versatility. Since Land Rover Ltd. was created in 1978 it has further enhanced the unique qualities of its products, firmly establishing itself as the world's leading maker of four-wheel-drive vehicles. The company is in fact the only major motor manufacturer to dedicate itself totally to design, development and production of this class of vehicle. Nearly 1.5 million Land Rovers have been built since the vehicle's introduction in 1948 and some 1.2 million of these are still in regular, daily service. Despite operating in some of the world's most arduous conditions, many of these vehicles are 20 or even 30 years old. Range Rover comprises an unmatched blend of style and durability and the vehicle won a British Design Award in 1982. It is equally at home as a luxury estate car or a fully functional police or military vehicle. Both vehicles are manufactured at Land Rover Ltd's headquarters at Solihull, near Birmingham, either in fully finished form or kits for assembly at more than 20 sites abroad, primarily in Africa. Since 1978, more than £ 100 million has been invested at Solihull to create some of the world's most advanced four-wheel-drive facilities. A new four-cylinder engine factory uses advanced transfer line machinery, while new assembly lines for both product ranges incorporate comprehensive electrical testing systems and computerised rolling road units. A major programme to consolidate all of Land Rover Ltd's manufacturing operations on the Solihull site is nearing completion and this will further increase efficiency. In the past components have been produced at up to 10 satellite plants. Land Rover currently employs a total 9000 people in developing, building and marketing its products. It has dealer or distributor representation in 120 territories around the world. The introduction of the Land Rover One Ten model in 1983 represented the most significant series of changes to the vehicle in its 35 year history. It was followed by the launch of the short wheelbase Ninety model one year later, together with a comprehensive transformation of the Land Rover range with improved levels of economy, ride, handling and refinement. Since its introduction in two-door form in 1970, product changes to Range Rover have accelerated with the introduction of the four-door version in 1981. Successive improvements have included an automatic transmission option, a five-speed gearbox and in 1984 a further 400 changes culminated in a new top line model, the Range Rover Vogue. The design of the One Ten and the Ninety incorporates many of the mechanical specifications that have made Range Rover internationally renowned for its smoothness of ride on all terrains. These include long travel coil suspension, front disc brakes and permanent four-wheel-drive. Both Land Rover models now make even greater use of aluminium for bodywork, ensuring enhanced vehicle life. An unmatched selection of standard body configurations is available for commercial, utility and private use. They include full length soft tops, hard tops, pick-ups and station wagons - each with a variety of trim options. Where there are specialised requirements, the company can provide conversions in the form of fire engines, ambulances, crew cabs, security and recovery vehicles, mobile workshops, hydraulic platforms and many other configurations. A diversed range of options add to the versatility and flexibility of the range. They include power take offs, winches, power-assisted steering and air conditioning. Whether as a luxury vehicle with extraordinary capabilities, a versatile estate car, or a general purpose all-terrain vehicle, the Range Rover has a unique niche in the marketplace. The latest versions are more refined than ever. Available in two and four-door variants, the Range Rover offers interior specifications ranging from functional to luxurious. Common to all models is a powerful 3.5 litre V8 aluminium engine, providing plenty of torque at low speeds, with remarkable smoothness for high-speed driving. The five-speed manual, or automatic gearboxes combine with a high/low transfer box to suit every conceivable operating requirement. Rugged suspension, featuring beam axles with long travel coil springs provide unequalled ground clearance, better traction, maximum stability and comfort and positive handling - aided by power-assisted steering. The suspension also incorporates a self energising, ride levelling unit. Even with five passengers there is a load space of 36 cubic feet, which increases to 71 cubic feet with the rear seats folded. 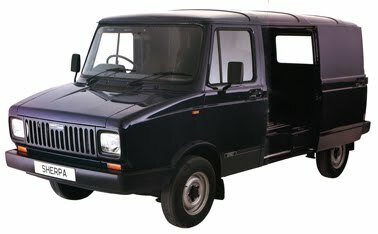 Formed in 1981, Freight Rover is responsible for design, manufacture and sale of Sherpa light commercial vehicles between 2.0 and 3.5 tonnes gross vehicle weight. Based at Common Lane in Birmingham, Freight Rover has now created one of the most advanced light commercial production facilities in Europe. Particular attention has been paid to vehicle body protection through comprehensive anti-corrosion and paint processes, while versatile body construction lines and extensive quality assurance areas help provide a durable and reliable product. Automatic body welding and robotic interior paint facilities are the latest elements of Freight Rover's investment programme. in the British market. Both British Telecom and the Post Office - two of Europe's largest vehicle fleet operators - have consistently placed significant orders for Sherpa vehicles. Freight Rover, which employs a total of 1700 people, offers a wide variety of light commercial vehicle types - including dropsides, chassis cabs, minibuses, crewbuses and even motor caravans in addition to conventional panel vans. Of greater significance to the customer is Freight Rover's ability to supply factory produced or approved conversions to a greater degree than any other rival manufacturer. This is a direct result of its investment in modern, highly flexible production systems - responsive to the demands of buyers, both large and small. The product is available in two weight ranges. The smaller Sherpa 200 Series incorporates gross weight derivatives from 2.0 to 2.8 tonnes. Power is provided by 1.7 and 2.0 litre petrol engines and a 1.8 litre diesel unit. All engines have been developed specifically for the demanding operating environment faced by light commercial vehicles. Advanced body construction techniques provide strength and there is a versatile choice of body configuration, including an exceptionally wide, sliding side-load door. On van versions, load capacity is 5.4 cu m, and load accessibility is enhanced by double, opening rear doors or a gas-strut operated tailgate. Minibus and Crewbus versions provide seating for 13 and 14 respectively, while a Combi derivative can also be specified offering a flexible combination of seating and loadspace. The second Freight Rover product range - the Sherpa 300 Series - is a new "widebodied" model offering significantly higher payload capacity. This model offers three gross weight versions - 2.85, 3.1 and 3.5 tonnes, and three wheel bases. Load capacity is from 7.6 to 11.3 cu m. Power is provided by a 2.0 litre petrol engine and a newly developed 2.5 litre version of the Land Rover diesel engine. A five-speed Land Rover gearbox is standard on all Sherpa models. Freight Rover has extensive dealer network of over 300 outlets in the United Kingdom. All of them sell the smaller Sherpa, with 120 dealers being responsible for the larger model. Freight Rover also has its own fleet sales team based at its Birmingham headquarters. The company is currently developing the export potential of the vehicle which is sold only in selected European markets at present. Land Rover Parts and Equipment Ltd. is a sister company to Land Rover Ltd. and Freight Rover Ltd., all these being wholly owned subsidiaries of Land Rover UK Ltd. The parts company, which became fully operational at the en of 1984, was formed to provide parts support service for Land Rover, Range Rover and Freight Rover vehicles. Because these products are sold into specialised sectors of markets around the world - and in many cases to major military customers - LRPE has established a dedicated parts support service which is vital element in meeting customers needs. LRPE is based at Bickenhill, near Birmingham, only a few miles from the Land Rover and Freight Rover manufacturing sites. It employs some 180 people covering marketing, distribution, pricing, supply and technical support. The company has 570 direct dealing accounts, of which half are in the UK and the remainder in overseas territories. Its total range covers some 30,000 part numbers. Over 98 per cent of its parts are purchased within the UK, from 2000 different suppliers. LRPE is the sole source of supply for the complete range of parts to original equipment standards for Land Rover and Freight Rover products and is dedicated to providing and effective, fast response to customer needs. The key to that service is an advanced computer system to handle the complex needs of order processing. The system establishes three key links - with the main warehousing operation, with dealers and with suppliers. Dealers have their own communications terminals linked with the main computer for immediate access to pricing and technical information, and the placing of both stock and emergency orders. The LRPE product line-up incorporates a complete range of reconditioned components, rebuilt to factory quality standards and fully supported by warranty. This is an important element of its range, since many users of Land Rover and Freight Rover products operate their vehicles for ten years - and sometimes for much longer. In addition to its parts support service, Land Rover Parts and Equipment is progressively developing a comprehensive range of equipment and accessories. The range includes such diverse elements as winching gear, trim packages, roof racks, auxiliary lighting kits, and a host of other accessories. For 90 years Leyland has been at the forefront of the design and manufacture of trucks. Today Leyland Trucks, a subsidiary of Leyland Vehicles Ltd., comprises manufacturing plants at three locations in the United Kingdom, producing both standard and special types for all applications. It is a highly integrated operation with extensive research, design and development capabilities and which meets a large proportion of its component needs from within its own plants. The main truck producing plant is located in the town of Leyland (from which the company derived its name) in the North of England. This £32 million assembly facility was opened in 1980 and is the most modern of its kind in Europe. The plant has a capacity to produce more than 500 trucks a week with a labourforce of just 1600. Here traditional engineering skills are blended with mechanised and automated techniques to produce a range of high quality trucks for conventional applications. Trucks produced at the plant are from the award-winning T45 range, covering from 6.5 to 40 tonnes. Also on the Leyland site, is Leyland Truck's engine plant. This produces two ranges of diesel engines which are based in the company's mid range trucks and with output ratings from 140 to 260 horsepower. Supporting this engine plant is a grey-iron foundry capable of producing castings of up to 350kg with an annual output of 13,000 tonnes. Recent investment has equipped the foundry with modern automated equipment enabling the product base to be broadened to include high volume items such as brake drums, as well as engine blocks and heads. Specialist vehicles are produced by Leyland's Scammell division at Watford on the northern outskirts of London. The plant here has also been the subject of a major investment programme which has provided a new assembly line and paint plant. Scammell employs 700 and its output includes super heavy haulage models of up to 250 tonnes gross weight, military vehicles and airport crash tenders. It is a stand-alone operation with its own engineering, finance, sales and marketing functions. However there is close co-operation in the use of components and in the sharing of technical resources. In Scotland, the Glasgow plant (formerly known by the Albion name) employs a skilled workforce of 1100 making axles for Leyland trucks. The factory also produces Leyland's Rollercam S-cam truck brake system which is acknowledged to be an industry standard setter. A substantial investment programme is underway to re-equip the Glasgow plant with the latest in high technology machine tools. At the centre of Leyland Trucks' engineering activities is its advanced technology Technical Centre which was established in 1980 at a cost of £22 million. This facility has some of the most sophisticated test rigs in the world, including Europe's largest semi-anechoic chamber (used for noise analysis studies). Extensive outdoor test facilities are also contained within the Centre's 60 hectare site and these enable the controlled validation of laboratory findings. Leyland Trucks places the highest emphasis on right first time quality. A Quality Director is a key member of its board and senior executives of the company attend quality audits are controlled independently of the manufacturing function and monitor the findings of quality checks which are a routine part of the production process. Leyland Trucks' standard product line is the T45 range - an integrated family of trucks designed primarily for European markets. Roadrunner is the smallest and newest model in the range, with weights of 6.2, 7.5 and 10 tonnes gross. It is primarily a light truck designed for local delivery work, which appeals to the small business where running a truck is incidental to the principal activity. 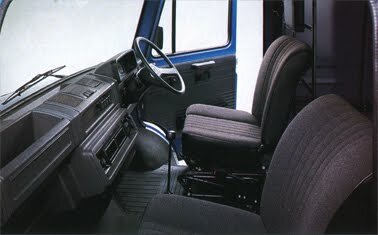 Roadrunner has many innovative features which were recognised in 1985 by a British Design Council Commendation. The truck was designed to match the requirements of UK legislation under which trucks of less than 7.5 tonnes can be driven on a car driving licence. Trucks of this type now account for one in four of all truck sales in the UK. Roadrunner, however, has an international appeal too. Next model in the T45 range is the Freighter - a middleweight truck in the 11 to 16 tonne range. It is an inter-urban delivery truck suitable for a variety of duties and with a range of engine and driveline options to enable precise tailoring of specification to application. Constructor 6 and 8 are multi-axle, non-articulated models primarily designed for the construction industry for operation at 24 and 30 tonnes. These rugged vehicles are market leaders in their field and enjoy a reputation for toughness and reliability under the most demanding operating conditions. Articulated tractive and drawbar units in the T45 family include the Cruiser range of lightweight models at operating weights of between 24 and 34 tonnes. Roadtrain is Leyland's premium tractive unit and is available in both two and three axle variants for operation at 38 and 40 tonne gross weight. Freighter, Cruiser and Roadtrain are all offered with day and sleeper cabs. A choice of engines and driveline components is available to satisfy customer preference and operating requirements. For export markets, Leyland produces the Landtrain range of bonnetted trucks. These have been designed to operate under the extremely arduous conditions often encountered in Leyland's key export markets in Africa, the Middle East and Asia. The tough features of Landtrain make it the ideal choice wherever road conditions and service support facilities require a straightforward, durable and reliable vehicle. The range includes rigid and articulated models from 19 to 65 tonne gross weight. From Scammell come specialist heavy haulage vehicles up to 250 tonnes and a range of military vehicles and airport crash tenders. The S24 range of bonnetted trucks is designed for extra heavy duty uses, hauling loads of up to 200 tonnes. Where a forward control truck is required, the Scammell S26 range is available and a series of military versions has been developed. Also for military applications, but with civilian possibilities too, the Commander tank transporter is the most powerful truck in production in Britain. Leyland buses are to be found in service in every part of the world and form the backbone of major fleets in over 50 capital cities. Every day more people travel by Leyland bus than those of any other make. Leyland buses are noted for their reliability and longevity and it's not uncommon to find them still in regular daily use more than a quarter of a century after they first entered service. Leyland Bus, the subsidiary of Leyland Vehicles Ltd. which now controls Leyland's bus interests, is based in the town of Leyland, 200 miles north of London. The company operates three plants in the United Kingdom. Farington Plant in Lancashire is the largest of these employing 1500 people. The site covers 1,750,000 sq ft and comprises a vehicle assembly operation and substantial component manufacturing facilities. A wide range of chassis is assembled here, along with axles, suspensions and gearboxes for use in these chassis and the products of the other chassis manufacturing plants. Vehicles produced at Farington include the Atlantean rear-engined double-deck chassis and the Victory front-engined single-deck chassis - both for overseas markets. The Ranger is a recently introduced vertical rear-engined chassis. Designed initially for service in Uruguay, this chassis will also be sold to other markets. The highest volume Farington product is the Tiger, a mid-engined, heavy duty, air-sprung chassis for use as a touring coach or for high-speed intercity operation. Normally produced as a two-axle vehicle, a three-axle Tiger derivative has been developed for those markets where there is a requirement to reduce axle loads, such as Australia. The Workington plant on the edge of the English Lake District is the most modern of Leyland's bus producing units and has over 500 employees. Established on a greenfield site in 1970 it is a highly mechanished plant which uses sophisticated production line techniques. Facilities include automated metal treatment, undersealing and finished paint processes. The factory manufactures the Olympian double-deck chassis, the Royal Tiger integral coach and the Lynx, a new integral single-deck city bus. Workington's advanced manufacturing techniques are now also being applied to the production of lightweight rail vehicles which embody some key bus technology enabling substantial cost savings to be realised compared to traditional rail vehicles. Considerable expansion and investment is taking place at Workington. This is in order to improve the flexibility of the plant, to cope with a wider variety of products and to enable the volume production of rail vehicles. The use of new technology, including robot welding and automated painting, is designed to further improve the plant's efficiency and productivity in a highly competitive industry. At Lowestoft in Suffolk, the Eastern Coach Works factory builds double-deck bus bodies on chassis supplied from Workington. The plant has a 500 strong workforce and uses conventional bodybuilding techniques requiring a high level of individual craftmanship. Lowestoft built products are in service throughout the UK and form the mainstay of the National Bus Company fleet - the largest in the world. More recently, the plant's products have entered service overseas in Greece and Hong Kong with further examples on trial in the USA and Egypt. Leyland Parts Ltd. is the third major subsidiary of Leyland Vehicles Ltd. It is responsible for providing a worldwide parts operation to support Leyland trucks and buses. Overseas parts sales alone are worth more than £40 million a year in 100 different countries. In addition, Leyland Parts markets a wide range of truck and bus parts for non Leyland vehicles under the Mulitipart brand name. This all-makes venture means that the Leyland Parts operation is by far the largest supplier of commercial vehicle parts in Britain and the concept is now being developed for export markets. Leyland Parts is located in Chorley, just four miles from the town of Leyland which houses the headquarters and principal manufacturing locations for both Leyland Trucks and Leyland Bus. On a 23 acre site the company has over half a million square feet of covered space - in fact the largest warehouse in Europe dedicated to the supply of commercial vehicle parts. The warehouse at Chorley contains over 100,000 different types of parts - worth over £100 million - ranging from simple washers to complete engines and truck cabs. Every year almost two million order lines are processed, covering 32 million invidual items. A £22 million investment programme is now nearing completion at Chorley and this has provided the very latest technology in computer systems and mechanical handling equipment. The latest development in the installation of a fully automated Very Narrow Aisle (VNA) store. This uses completely automatic cranes to deliver and collect components in direct response to computerised customer order inputs. A major factor in the operation of a successful parts back-up operation is in the speed of response to order requests. Commercial vehicles - like any other plant - must be fully utilised and instant availability of parts, to minimise costly downtime, is the key factor in determining future vehicle buying policy. A considerable investment has been made at Leyland Parts to ensure the fastest possible turnround of parts orders. Late in 1984 Multiparts backed its committment to this strategy by offering to compensate UK truck operators in the case of late deliveries of parts. If a part is not delivered the following day (providing the distributor places the order by 12 noon) Multipart will provide the part free (up to a maximum of £100). In the first six months the scheme was in operation there were only seven claims for late delivery. Many Multipart distributors and dealers - there are 160 in the UK alone - are connected to the Chorley centre by direct computer link. This facility extends to major fleet customers too - including some far away as Hong Kong. Leyland Parts also operates a dedicated manufacturing facility producing parts for non-current vehicles - important in an industry where vehicles, particularly buses, may stay in service for 25 years or more. Land Rover-Leyland International Holdings Ltd. controls all the overseas operations of the Land Rover-Leyland Group. These range from the major vehicle manufacturing operations of Land Rover Santana in Spain and Ashok Leyland in India to a total of nearly 30 associated and subsidiary companies in many different countries. One of Land Rover-Leyland's greatest strengths in the international motor business is the flexibility and experience which it can offer to overseas customers and governments. Evidence of this flexibility is provided by the variety of operations which go to make up its business outside the UK. For example, in some of its markets Land Rover-Leyland offers vehicles imported complete from plants in the UK. In others it sells vehicles assembled locally from kits supplied from Britain. Elsewhere vehicles are assembled using some Land Rover or Leyland components; and in others the UK product companies provide only technical support, with all components being engineered and manufactured locally. A recent and highly successful expansion of activities in several African subsidiaries has been the development of Land Rover reconditioning business, particularly important in territories where funds for new vehicle purchases are constrained by the world recession. This totally flexible approach is vital in allowing Land Rover-Leyland to co-operate with national governments in programmes which call for the transfer of technology. This important concept involves the creation of whole new industries in nations which are striving to establish their own industrial base. Probably the most graphic example of success of this process is in Madras, India, where Ashok Leyland now operates as a company within Land Rover-Leyland International with virtually no UK produced components. Ashok is totally managed and funded from Indian resources. The Indian company has successfully developed its own research and development and engineering facilities to the extent that it can now design its own key components. Leyland engineers provide a technical advisory service on a consultancy basis and Ashok still manufactures certain key units under licence from Leyland in the UK. Similar - if somewhat smaller - co-operative ventures involving Land Rover-Leyland expertise exist in many other parts of the world, particularly in Africa. In that continent the Group's subsidiary and associated companies quite literally provide a vital lifeline for several nations economies. This help is not only in the provision of reliable, sturdy vehicles capable of providing basic transport services for both people and goods, but also in the building of key industries which can become self-supporting, viable businesses. Most economists recognise that the creation of a motor vehicle manufacturing venture is an important step on the road to industrialisation. Land Rover-Leyland not only assists with this process but also is operation of its products. For example in the Mozambique capital, Maputo, the company has played a key role in restoring the city's bus fleet (which had fallen into disrepair, with only 38 out of 320 buses being available for service) to an efficient public transport service. As well as arranging for the independent funding of a fleet of 150 new Leyland buses, Land Rover-Leyland experts have completely overhauled the management and operations of the bus company and have been able to provide a first rate operation able to serve the needs of the people of both the city and country. Like most Land Rover-Leyland projects, the rebuilding of the Maputo operation was carried out under a co-operative venture with the national government. The Mozambique project is only one of a number around the world. Bus operators in Zaire, Hong Kong, Barbados, Venezuela and Nigeria have all received assistance from Land Rover-Leyland technical experts, and the list of truck operators helped in a similar way is lenghty. In addition to creating sound assembly, manufacturing and operating facilities for its own products, Land Rover-Leyland International also undertakes contract assembly for other manufacturers. Renault, Nissan, Volkswagen, Hino and Mitsubishi all rely on Land Rover-Leyland factories for the assembly of their car and commercial vehicle products in certain African markets. A very different example of Land Rover-Leyland's operations is provided by Land Rover Santana, a major manufacturing operation in Spain in which Land Rover-Leyland has a 46 per cent stake. This company, as well as making and marketing a wide range of Land Rover-based four-wheel-drive products, has recently commenced the manufacture under licence of the Japanese Suzuki light four-wheel-drive vehicles. Land Rover-Leyland International is a worldwide business with a turnover in 1984 of £290 million. Its operations span everything from bus manufacture in Denmark, Land Rover manufacture in Spain, Land Rover and Leyland truck and bus manufacture and assembly throughout Africa, truck and bus production in India to bus sales in the Far East. Below is a full list of the names and addresses of Land Rover-Leyland's subsidiary and associated companies. This side on my site here at www.range-rover-classic.com is a re-write of the brochure that covers the Land Rover-Leyland Group. 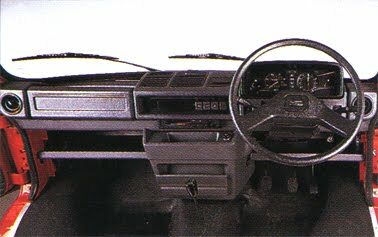 Interior from the 1985 Freight Rover Sherpa. Great visibility.